You know what makes perfect sense? To be a manufacturer of processor chips and announce that you plan to stay away from the tablet market when sales are projected to grow by 181 percent next year. Yep, makes total sense to me to completely stay away from the fast growing market for processor chips. According to the Gartner Group, sales of Apple’s iPad tablet are going to help the tablet market grow to 19.5 million units this year, and sales could ready as high as 54.8 million for next year, representing a growth of 181 percent. By 2014 the analysts are projecting sales numbers could reach a staggering 208 million units. A lot of these sales for tablets that are 10-inches and above will come from enterprise sales, and those that are 7-inches and smaller will probably cut into some smartphone sales. With all of this on the table, AMD’s Chief Executive Dirk Meyer said yesterday in an earning’s cal that his company is staying out of the market for making the chips to power tablets for the time being. Apparently Mr. Meyer feels that the best idea is to wait for the market to mature before the company commits any money to research and development. The problem with this thinking is that AMD reported a loss of $118 million for the quarter, which was an improvement over the same quarter last year that saw a loss of $128 million. Mr. Meyer admitted, however, that tablets were starting to cut into sales of devices their chips do indeed power. “Clearly, in the last quarter or two, the tablet has represented a disruption in the notebook market,” he said. “If you ask five people in the industry, you’ll get five different answers as to what degree there’s been cannibalization by tablets of either netbooks or notebooks. I personally think the answer is both, and given the pretty high price points of the iPad, there’s probably some cannibalization even of mainstream notebooks,” he concluded. So, while we doubt AMD could get into the iPads (okay, we know they couldn’t), shouldn’t the company at least be thinking about tablets by now? Perhaps he was just being cagey? But to what point would that serve? If tablet companies are looking for chips, and they don’t think you are even working on them, won’t they just go elsewhere? It looks like the tablet form factor is going to be with us for some time to come now, and ignoring it seems a risky policy at best. What say you? 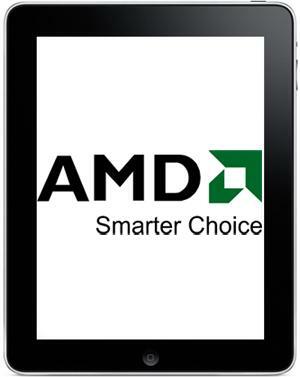 Is AMD making a mistake by ignoring the tablet market for now?